Assam Postal Circle GDS Result 2017 notification about Gramin Dak Sevak Exam declared lists & also Check Assam Post Office GDS Result below. Assam Postal (India Post) recently announced Assam GDS Results 2017. All the candidates who are eagerly waiting for their GDS Exam results have been out now in Assam postal official website. Qualification: The candidate should pass 10th standard from approved state boards by the respective State Govt. / Central Govt. 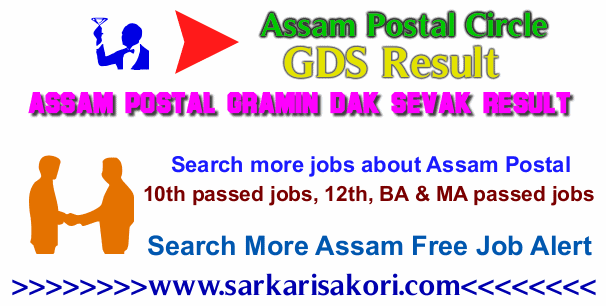 Check Assam Postal Circle Recruitment 2017 Gram Dak Sevaks (GDS) earlier job details. * Now check on the left side of the webpage. * You can see now "Assam" state click on the results tab against the state "Assam". * Instantly a .pdf file will be downloaded to your mobile/ computer. * Now search your result by typing your name/ Registration Number. OR You can check Assam GDS Result 2017 merit list directly here. You will be interested more info about Assam Postal Circle GDS Result 2017 Exam Results & Latest Assam Govt Jobs Alert 2017.